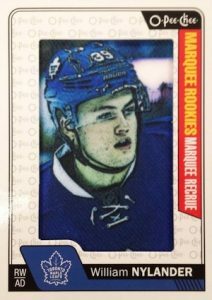 2016-17 O-Pee-Chee Hockey continues to hold down the retro market for NHL collectors and includes a deep base set and several popular inserts. While there are no guaranteed hits, each box yields a plethora of cardboard variety. 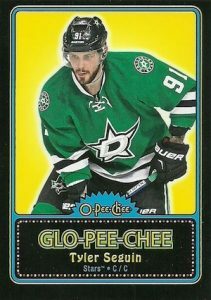 Already known for a massive checklist, 2016-17 O-Pee-Chee Hockey increases the total base set to a whopping 660 cards. In addition to the 550-card main set, these are various short prints that fall in every other pack, including the popular League Leaders, Marquee Rookies, Season Highlights, and Team Checklist subsets. 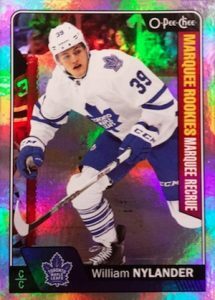 Collectors can expect appearances by William Nylander, Kasperi Kapanen and Josh Morrissey in the Marquee Rookies checklist. Parallels enhance the base set with Gold Rainbow Foil (1:4 packs) and Black Rainbow Foil (#/100). Retro continues to supply the old-school look in 2016-17 O-Pee-Chee Hockey. These cards fall in every pack. 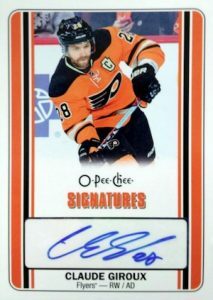 Although fairly rare, autographs do appear in 2016-17 O-Pee-Chee Hockey. 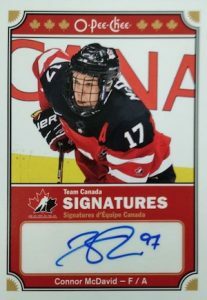 OPC Signatures (1:192) drop two per case while Team Canada Signatures (1:384) are a case hit. O-Pee-Chee V Series C (1:16 packs) inserts include the third batch of the 2.5" x 2.5" cards that take their design from pre-war hockey sets. Offering a new addition to the set, OPC Playing Cards fall 1:8 packs overall. More specifically, cards #2 through King average 1:9 packs while the Ace is much tougher at 1:200 packs. There are also standard 2016-17 O-Pee-Chee Hockey retail boxes and blasters. 660 cards. Shop for complete sets on eBay. PARALLEL CARDS: Rainbow Foil (1:4 h/1:8 r,f/1:7 b); Retro (1:1 h/1:2 r,b/2:1 f); Black Rainbow Foil #/100 (Hobby), Red Border - 5 per Wrapper Redemption pack. 28 cards. Specific group odds noted below. Overall Odds: 1:192 h, 1:400 r, 1:800 b. 27 cards. Specific group odds noted below. Overall Odds: 1:384 h, 1:1,200 r, 1:2,400 b. 100 cards. Overall Patches Hobby Odds - 1:96. Subset Hobby Odds: Base - 1:156, Legends/Rookies - 1:835. Overall All-Star Hobby Odds: 2016 - 1:1,043; 2008-2015 - 1:626; 1988 - 1:4,176; Mascots - 1:3,912; Rare Mascots - 1:31,296. Overall Odds: 1:8 h/r, 1:17 b, 1:4 f.
ACE Cards Overall Odds: 1:200 h/r, 1:400 b, 1:100 f.
30 subjects. One per Wrapper Redemption Pack. 40 cards. Overall Odds: 1:16 h/f, 1:32 r/b. 6 cards. Two per Blaster Box Bottom. 16 cards. Four per Hobby Box Bottom. My favorite set of the year and the only one I try to collect the entire thing like the old days. Thanks for bringing the news to us so early! I’ve got 9/7 locked in now! I assume McDavid, Domi and Larkin rookie cards will be in 16/17 as well? 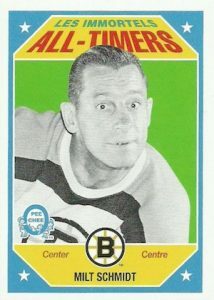 Will the OPC Playing Cards have images of hockey players on them? Hey Trey, how come there is a case for retail boxes and not the hobby boxes? Aden Taylor � There is a case format for both. It was just not listed for Hobby. 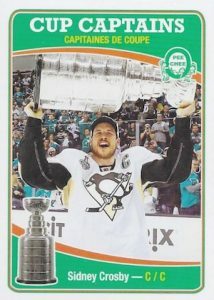 Hey Trey, will the OPC Playing Cards have images of hockey players on it? Aden Taylor � I would imagine so but they were not part of the solicitation so we won’t know until UD puts out live card images. Will the Wrapper Redemption be back again this year? Also are cards 651-660 SSP as in previous years? Typically 50 rookies and 50 legends…. When will the checklist be available ? Why not 5 stars, a good product year after year perfect for old folks to bring back fond memories and also fit for newcomers to discover. Where are the Legends base?????? I really like the look of this years cards. Sure a lot nicer than the base cards from 15/16. What do the retro look like? Point me to a picture please! 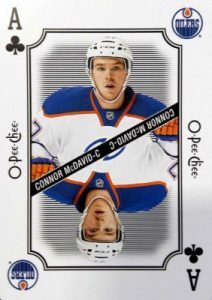 The playing card set looks like a nice addition but I am left flabbergasted that OPC has decided to not have Marquee Rookie cards for McDavid, Eichel, Larkin and Domi. Two years in a row I will not be buying. 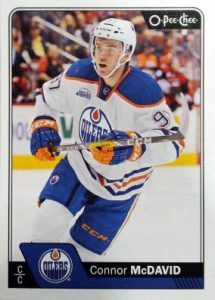 Bondurant, the Marquee Rookie cards for McDavid, Eichel, Larkin and Domi were in the 2015-16 UD series 2 and the 2015-16 OPC Platinum. Regular OPC only has holdover rookies in the set. That means only players who made their debut later in the 15/16 season are included. Any word on if there is a surprise insert set this year? In past years it was the Woodies or the Black & White deckle edge sets. Maybe something unexpected this year as well? Just saw a tweet with an ‘all-black’ super box? Anyone else able to confirm these? If you have read my comments from last year, I was really upset with Upper Deck over the Trilogy set (still am). Upper Deck does O-Pee-Chee the right away. It is fun, not too expensive, great for set builders and has surprises. I love the Retro cards this year. I believe the bonus cards are Glow-Pee-Chee cards. One has just popped up on ebay. 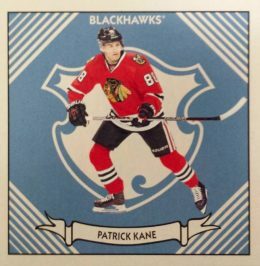 I am still opening my case but have had two Award Winner Patrick Kane cards (same one), this is a little unusual. George W@ What do you mean by that? I had a box in which I had something like 20-25 black cards. Normally there are 2-3 per box. Mark@ Indeed mate, there are 3 on eBay now. I pulled a Bobby Orr in Glow. I was down to my third last box in a case and found out what the “all black” super box is. Each pack has one black rainbow foil card in it for a total of 32. I had 4 Marquee Rookies that were Pontus Aberg,Alex Friesen,Miles Wood and Oskar Sundqvist. There was a Jonathan Toews League Leaders, a Patrick Marleau season highlights, one checklist and the rest were base cards. Pretty cool idea by Upper Deck to include that many /100 Black Rainbow Foil cards in one box. I am assuming this is not every case so I must be lucky. The box still had an All Timers card and the rest of the ratio each box has. No, I saw a tweet earlier, the guy pulled 200 blacks out of the same box, called it a super box, and UD retweeted. I responded to the tweet to ask if these were a surprise, and still haven’t gotten an answer. Well that is a super box. The one I had was still not bad. The other 11 boxes had 2 per box. Update us if you do hear back. All of these All Star cards, but not 1 John Scott card?! 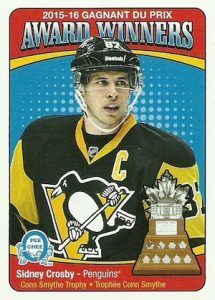 There is also a Stanley Cup Captains insert. You bet ! the super box is real. Brother bought 3 cases, as I helped him open he hit a box with a black in every pack so we thought he hit the jackpot. But then his last case, with 2 boxes left, opened a pack and it was all blacks except for 1 retro. EVERY pack in the box was the same, 7 blacks and 1 retro or other insert. I assume that means UD didn’t sell as many cases as expected and wanted to get the parallel’s out there so they loaded up boxes/packs randomly with leftover’s ?? Pulled a “super” box as well. All black rainbows except for 1 retro per pack and all of the other regular inserts. It was cool, as the /100 cards have value, but I was also a bit bummed as I really just want to build my regular set. I guess I’ll have to “move” a bunch of the black cards and buy another box. Good as always. You can’t go wrong with OPC. 1. A box with a black in every pack. 2. A box with packs full of black except one retro card. 1. There are no blank back cards anymore. Or, at least, I didn’t pull any in 2 case. 2. I would have liked to see the mention “retro” at least on the back of the checklists because it’s difficult to distinguish them besides the colour. What’s the wrapper bonus? Is it still red border cards? How many wrappers to get a pack? T.C.Boutique � We have not seen anything official from Upper Deck that specifically details the program but the Red Border parallels are back in the redemption packs (5 per pack) along with one Puck Sticker. Both are noted on the checklist above. I believe it is 50 hobby wrappers to earn one redemption pack. I hit 2 super boxes in 2 different cases, I think I have the code down pat on the boxes to find more super boxes also. I purchased a 2nd case yesterday and enjoyed once again. Found out that this 2016-17 O-Pee-Chee set may be limited. My one store sold out and was not sure if he could get more hobby cases, maybe retail. I went to a second store and they had one left and were hoping to get more cases. Usually collect the UD, but like this set alot. My biggest problem is that I’ve broken 6 boxes and am still 50-60 cards short of completing even the base set but have a TON of duplicates. Luckily, my sons love them too, so the extras don’t go to waste. Since this is my first time with the OPC, is there a general guideline for how many boxes it takes to complete a set or the bet way to do it? Did hit one of the boxes with a black in every pack. Also, did hit 1 blank back card.